7/09/15 – Update v5.2 Superfight DLC – New Anime & The Walking Dead Decks & Engine Upgrade! 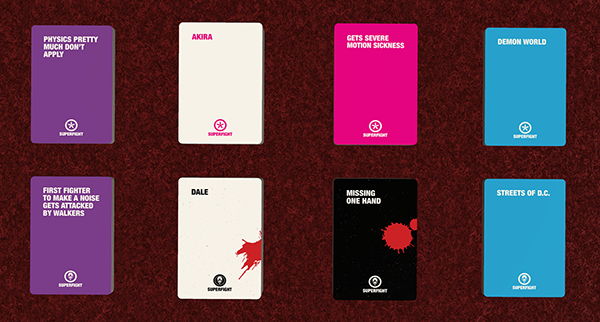 As an update to the existing Superfight DLC, we have added in two new decks for free, The Walking Dead and Anime! The physical Anime deck premiered at Anime Expo on July 2, 2015 and the physical Walking Dead deck premieres at San Diego Comic Con on July 9, 2015! The Walking Dead Deck is an expansion to Superfight that adds 100 cards inspired by Robert Kirkman’s hit comic book series. All of your favorite survivors and villains are here, along with the darkest set of attributes yet. DO NOT SHUFFLE, DEAD INSIDE. The Anime Deck is an expansion to Superfight that adds 100 cards inspired by your favorite anime. From Pocket Monsters, to Titans, to Sailor Scouts, this deck is ready to raise your fights to a new level of insanity, the kind you can only find in Japan. If you’re at Comic Con, stop by the Skybound booth #2729 and the Superfight booth #2800 to say hello and check out all they have to offer! Two new decks added; Anime and The Walking Dead! The Superfight card boxes now function identically to bags allowing you to store objects inside of them. Added a button to the Superfight box that will open a link to sign up for Skybound’s Insider program for extra perks. Updated to Unity 4.6.7 the latest 4.x version of the engine. Unity 5 is currently not an upgrade path due to the physics limitation with concave colliders. If you run into any new bugs let us know as it could be due to this upgrade. Moving objects around has been smoothed out and is less stuttery. Added a timeout period when the connection to a host slows down to a crawl. The d-pad on the controller has now been mapped to panning the camera around (WASD). All keybinds have been reset to default due to this change. Fixed tinted custom dice losing their tint. Fixed potential custom dice collision issue. Custom objects will no longer delete if you close the import menu with an already created object.